Fashionably sleek and modern looking, the 625 Model is in a choice of 7 stunning colours. Transform your health and easily match to your personal style or kitchen décor. Featuring all you need to create boundless healthy and supremely delicious smoothie bar quality smoothies and other culinary creations in 90 seconds or less. Premium features include: illuminated touch interface (touch pad), 4 preprogrammed cycles to create the perfect blend every time for your smoothies, ice cream / frozen treats, whole juice and hot soups. As well as customized blending precision controls to adapt and create your own perfect blends. LOOKS: Designed with your needs in mind. The 625 model, is super easy to match your personal style and kitchen. POWER: Powerful 3.0 peak horsepower motor is very powerful which means that you can blend tough tasks perfectly without straining the motor. This is very important when blending tasks such as crushing ice and frozen fruit, blending grain into flour, or making thick dense soup in seconds or the occasional iPhone (as demonstrated on the Blendtec YouTube’s “Will It Blend” channel). Tougher blending tasks, wear down low horsepower blenders causing lesser blenders to stall, underperform and eventually break. EASE OF USE: Modern artfully engineered control interface via an Illuminated capacitive touch screen. It displays intuitive easy to use and see controls, consisting of icons, slider and digital view of blend time (and time remaining on active blends). The touch screen (control panel) turns on (lights up) with a touch and shuts off automatically. The Designer 625 Model provides the most popular pre-set functions as well as the ability to customize blends. SET AND FORGET WITH: 4 Preprogrammed Cycles - Enjoy hands free, set and forget (or tap and go) with a choice of 4 preprogrammed cycles. Each cycle is optimized with varying speed up and slow down phases creating perfect blends for each. Ice cream and frozen treats such as sorbets and frozen yogurts: 65 seconds. PRECISION & CONTROL WITH: Six Speed Touch Slider + Pulse – Go off-road and enjoy making up your own blend cycles for your culinary adventure creations. Customize your blends freestyle and add-on a touch of custom blend time to preprogrammed cycles when just a tad more is preferred. Easy to use custom controls, simply slide finger on illuminated slider to blend in a choice of 6 speeds. Or touch the Pulse Icon on the right when you want bursts of higher speed blending. EASY TO CLEAN: Thanks to smart engineering, enjoy fast & easy cleaning both outside (smooth touch screen and base – damp cloth wipe) and inside (jars – blend with water & dish soap then rinse). SAFE: Advanced engineering with superior safety in mind. PEACE OF MIND: Blendtec’s 8-year warranty covers both the blender and the included jar against defects or everyday wear and tear. Compare this to the stingy 1 year warranties of some other manufactures. NOTE: You can purchase additional jars to have more containers on hand for making multiple recipes as well as for specialty tasks, just note that the additional jars, that do not come within your blender package, have the standard industry leading Blender Jar warranty period of 3-years. The Blendtec 625 blender is a fusion of raw power and great looks. The power that is expected from a Blendtec coupled with all the style and elegance that is the hallmark of the Designer Line Series. All at an affordable price. Packed with value, featuring the most popular 4 pre-set cycles for your favourite dishes and beverages as well as manual control with 6 speed slider, for your freestyle creations. Available in a choice of 7 fabulous colours. You can easily pick a colour that perfectly matches the kitchen décor of your personal style. For those debating what Blendtec model is the best fit for you. You may find it helpful to review how the 625 model compares against some other amazing Blendtec models. To see what the differences are, check out the following compare pages: Blendtec Designer 625 vs Classic 575, Blendtec 625 vs 650, Blendtec 625 vs 675 and Blendtec 625 vs 725. Note that some special deals shown in the compare views are limited while supplies last. If you have questions please contact us. Comparing Blendtec vs Vitamix? Looking for a Blendtec Designer vs Vitamix Ascent comparison? Check out the Blender Battles, where we have the most similar blender models of Blendtec and Vitamix duke it out in boxing fashion. Ready? Jump on over and in front row now! Blendtec Fit Blender Battle coming soon! It saved a days worth of work! It took a fraction of the time to make! Did not have to peel the tomatoes! She shared some pictures showing the recipe start, middle and end. Kimberly canned her sauce, which means she put the sauce in jars to preserve them. She does this because she gifts them at Christmas (awesome idea! ), along with keeping some for her family too. How much sauce did she make? She says "With 20 lbs of tomatoes, her recipe yielded four 1-litre jars, and four half-litre jars". Don't you just LOVE that! It is certainly a blender recipe that gives a tonne of satisfaction! When Kimberly shared this, it made this Blendtec Fan, want to get Kimberly's recipe and follow her example, with the small difference of freezing it in meal batches instead (no experience with canning here). Feel same? Want her recipe? Well, Kimberly gave her OK to share here with you. (Thanks Kimberly :)) Just scroll down, under the pictures below. She granted permission to share this email of the recipe here. Honestly, I call myself the "queen of substitutions" when it comes to cooking....I never seem to have the exact ingredient on hand, lol! With this recipe, I did kind of wing it, as I actually had no recipe to follow. I blended 5 Roma tomatoes at a time, with a handful of peeled and quartered sweet onions, a handful of peeled garlic (maybe about 10 pieces?) and a handful of fresh basil leaves. 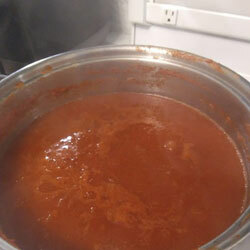 Then blend until smooth, and cook over a medium heat for about 2 hours. To the sauce (as it was cooking) I added dried oregano, salt and pepper,(maybe a teaspoon of each?) a small can of tomato paste and about a cup of red wine with each batch. Once it cooks down you can taste it and add more seasonings if you like, and then I ladle it into clean jars and process them in a water bath for 40min. It sure beats the canned sauce from the store! And your heirloom tomatoes would make a beautiful sauce! With 20lbs of tomatoes, it yielded 4 1 litre jars, and 4 half litre jars. Doesn't seem like a lot, I know, but it is worth it! Although it is probably easier to freeze it in batches....but I give it out for Christmas gifts as well, so maybe in the next batch I'll do it half and half! Happy canning to you! So there you have it. 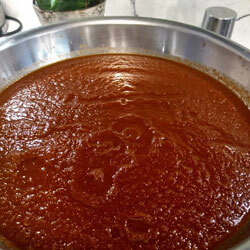 Kimberly's Blendtec Blender Recipe for Tomato Sauce. Hope you enjoyed it and please let us know if you have one to you'd like share with us via email and/or online. Note: If interested in canning, this requires some know-how to do safely and will require some education. If you get a canning kit, it should come with instructions for safe and efficient canning, which will be best to follow. 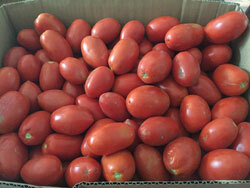 For a quick intro on canning, here are a couple of articles we found on canning tomato sauce. Click the button below to add the Blendtec Designer 625 Blender + FREE Twister Jar to your wish list.